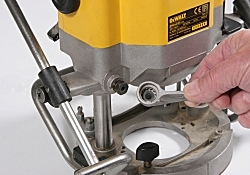 With routers with lever plunge lock, such as the DeWalt DW625, the lever has to be pushed down further and further as the soft brass pellet, which actually locks the plunge, wears. Eventually, the lever might become uncomfortable or awkward to press down far enough to lock the plunge. When you reach this stage, lock the plunge and undo the lever retaining screw. Then rotate the lever on its splines until it locks in a position that’s comfortable for your hand. Replace and tighten the retaining screw and you’ll work more comfortably. 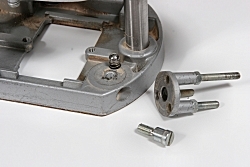 If your router has a spring lever, note the position of the spring before removing the lever. With extended use, particularly when cutting MDF, the switch might become temperamental as it gets clogged with fine dust. The only long-term solution to this is to replace it, but with many routers you can often keep going for a while by unscrewing one or two screws that hold the plastic housing around the switch and blowing and tapping out the dust. If you want to replace the switch, there are two simple connectors to undo and redo. 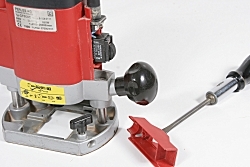 Many routers have a rotating turret used in conjunction with the stop bar to set depth of cut. With extended use, the turret tends to become stiffer and stiffer to rotate. This is because dust gets under the turret and fills the drilling, which houses a spring and a ball-bearing to provide the ‘click stops’ when you rotate it. The remedy is to undo the screw holding the turret and gently remove it, taking care not to lose the spring and ball-bearing. Blow the dust out of the drilling and put a thin smear of grease on the mating surfaces then replace the spring and ball-bearing and screw on the top again.